"I never felt any loyalty towards the British," writes Stanley S.K. Kwan in his memoir. It's a surprising statement from a man who was born and raised in the British crown colony of Hong Kong and whose services to the colonial government resulted in the award of an MBE -- Member of the Most Excellent Order of the British Empire -- after his retirement. 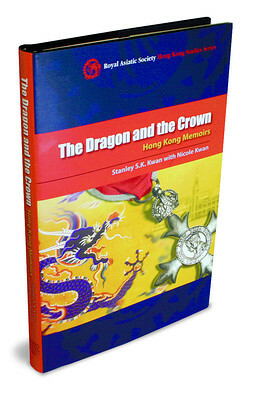 In his memoir "The Dragon and the Crown," it is clear the Chinese dragon always won out over the British crown. Born into a family "steeped in Chinese culture and tradition," Mr. Kwan had always seen himself as a Chinese patriot. As a 13-year-old attending King's College -- "the most modern and well-equipped school in Hong Kong" -- he helped raise funds for disaster relief in China by singing patriotic songs. Already, at that young age, he felt conflicted: "China was my country, but I had to live under British rule; I loved China, but I was distressed by its weakness." The British acquired Hong Kong in the mid-19th century because they wanted a base from which to trade with China where they would not be subject to the unpredictable whims of Chinese officialdom. Soon many Chinese from Guangdong, including the author's forebears, arrived to seek their fortunes. Each time China was wracked by political upheavals, waves of refugees would descend on Hong Kong. Even though there was no democracy, the colony offered basic freedoms. Over the years, Hong Kong thrived as an island of calm in a sea of political turmoil. During World War II, although exempt from compulsory military service because he was from Hong Kong, Mr. Kwan joined the Chinese military. As an interpreter, he was entitled to all the facilities and benefits that American soldiers had. While he was happy about the improvement in living conditions he was again torn internally because "I felt somewhat uneasy about the change, as if we had traded national dignity for material well-being." Mr. Kwan's life is a compelling story, and he tells it well in this new biography with the assistance of his niece, Nicole Kwan. On one level, Mr. Kwan had a wonderful career. He was a successful banker, spending 22 years with the Hang Seng Bank, where he devised the Hang Seng Index, the Hong Kong equivalent of the Dow Jones Industrial Average. Before that, he was a China-watcher with the U.S. Air Force Liaison Office in the American consulate-general, gathering and translating materials concerning the strength and movements of the Chinese Air Force and had also worked at one time for a British company, Dodwell Motors Ltd. However, he was torn between two loves: for China and for freedom. After World War II ended, Mr. Kwan "looked forward to Hong Kong's return to the motherland," and had mixed emotions when the British resumed their administration of the colony. The communists successfully infiltrated postwar Hong Kong -- and Mr. Kwan's own family. Mr. Kwan's younger brother Tse Kwong joined the Chung Wah Music Academy, a fringe organization of the underground Communist Party. The youngest brother, Yuan Kwong, joined the Rainbow Chorus, also under Party control. Mr. Kwan himself did not belong to any formal organization. "What struck me as strange," he recalls, "was that the pro-communist camp which called itself 'democratic' never saw the need to uphold individual freedom, while the Nationalist camp which prided itself on representing 'freedom' never thought to advocate democracy." With China divided into opposing political and military camps, Mr. Kwan decided to sit it out in Hong Kong, as did his older brother Man Kwong. But his younger brother Tse Kwong joined the underground Party and in September 1949, at the age of 23, left for the mainland to "join the revolution." The People's Republic of China was founded a few weeks later. Yuan Kwong soon followed. Politics was splitting the Kwan family. The next three decades saw China torn by one political campaign after another as the Communist revolution devoured its own children. Mr. Kwan, from the relative tranquility of Hong Kong, could only watch as Tse Kwong and Yuan Kwong were repeatedly buffeted by political storms. Both were sent down to the countryside and accused of subversive activities. Meanwhile, Hong Kong prospered. The Hang Seng Index devised by Mr. Kwan rose from 158 on Nov. 24, 1969 to 15,196 on June 30, 1997, the day Britain returned Hong Kong to China. As the time drew near for the realization of his dream of Hong Kong's return to the motherland, however, Mr. Kwan decided that he himself did not want to live under Communist rule. "I was not ready to give my loyalty to an authoritarian regime," he writes. Instead he emigrated to Canada -- and it is from his home in Toronto that he wrote this book. It is a sad commentary on China that someone like Mr. Kwan, the ultimate Chinese patriot, should weigh the Communist Party and find it wanting. Mr. Kwan discovered that the China of his dreams did not exist, while in Canada he has found freedom and democracy. Mr. Ching is the author of "Ancestors: 900 Years in the Life of a Chinese Family," reissued this summer in paperback by Ebury Publishing.